Surprise!! I’m stopping in on a Sunday to bring ya’ll another super fun and exiting CRAFT JUNK GIVEAWAY!! Back in January, some of my crafty friends and I got together to give away supplies from our own hoards of craft supplies. Ya’ll loved it so much that we decided to do it again in May. And now I have another one for you! What better way to clean out our stashes than to give the extra supplies to you, right? Hi, Christy, I have been following your move and I really like your new home. Moving is hard, but now comes the fun part; you get to shop for new things and decorate. I love your style. I am sure that your new home will be beautiful. Looks like a great box of wonderful goodies. I’m a new follower of your blog and so happy to have found you! My husband and I are in the process of our own backyard makeover and think your backyard makeover instructions are the best. We loved the way your backyard turned out – it’s beautiful and most importantly to us – you have very good instructions on how a “do-it yourselfer” can achieve similar results. Thank you! PS, would love to win craft supplies too! Would love to win this, so many goodies! Thanks for having this again…. I just love DIY and crafts. I am one person that will pay for handmade things. I love when someone puts in their personnel touches. A girl after my own heart! I am the same way! What a great box of things to get my creativity flowing! I love this site! My favorite thing is see the makeovers before and after pictures. It is so inspiring. Fun Fun Fun!! I adore every single piece you make new again. Your endless energy motivates me, and your sweetie pie disposition inspires me. Thanks for sharing your talent with the world! I love, love, love that paint color!!! Please send me your junk! I promise to use it with lors of love and creativity! Nice box of craft “junk'” (NOT), would be happy to take it off your hands and put it to use! I love the colors you use! I hope you never get discouraged by the negative comments ppl make on FB. Your work is always good ! Hi Christy, if I still lived in my Home Town (Hampton) we’d be neighbors! However, I’m living in SW Floridea, now, but my family are all still there. I’m a late-life beginning crafter, and I love your “stuff.” Sure hope I win. Love your blog and your giveaway. Hope the house is coming along. I can’t wait to see some photo’s. Love your ideas you are very creative! This box of goodies looks better than a box of chocolate!!!! That looks like a box full of fun! What are the rose things? I would love to win! Especially those rose buds! 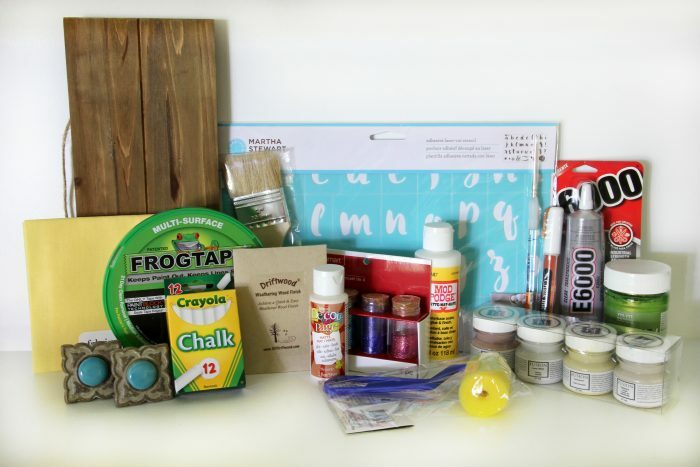 Oh my gosh, I would LOVE to win one of your craft goodies box. Keeping my fingers crossed. Thanks for doing the giveaway! Christie thanks so much for the great giveaway! Fun stuff. I’ve been loving your blog, and who doesn’t love a give-a-way? love love this giveaway!! Would love to win! Third time I saw a charm!!! I always love everything in your goodie boxes!! Lol, Christy you must think I’m a little looney!! I meant third time IS A charm, not I saw a charm! Haha~damn autocorrect!! This is awesome! My daughter recently got married and is desiring to start her own “craft closet.” It’s hard to borrow from me when we’re 1200 miles apart :(. She lives in FL so the beachy theme/colors would be perfect for her. Thank you for the giveaway! Trying to convince my husband we can install engineered hardwood flooring after reading your blog about the flooring in the home you just left and the one you have moved into. We don’t have anything close to the sq. footage y’all have! Enjoyed the tour, looking forward to all your new projects that will inevitably take place. Love seeing your progress including your move, I have moved 6 days in 9 years, yikes so understand what you are going through. It’s a process! I’m looking forward to seeing your new home come to life on your social media posts! The contents of your junk giveaway box look pretty too! Thanks for the opportunity to enter! Oh fun!! I never win stuff but hope springs anew!! Looks like lots of cool stuff. You always have the best stuff to giveaway! Congrats on your new home. Can’t wait to see more updates. 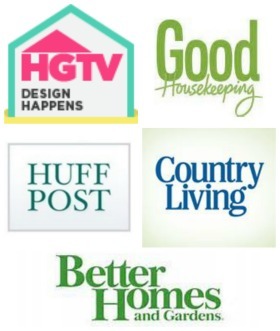 I use many of these same products and love them! Oh I would love your box of craft “junk”! Thank you for the chance to win more craft junk! I’m excited about possibly winning!! My husband? Not so much. Lol! Love your site! What an amazing gift. It would be fantastic to win. Thanks for doing this. Would love to win! Colors in this box are great. Fun stuff! Thanks so much. Yeah! Your craft junk would love my craft room and projects! They’d mingle together and find lots of new friends! I would love to win! I always look forward to reading your posts! Thanks for the chance to win your surprise box! Looks like an awesome box! Thank you! Love your site! This is the one I keep coming back to for ideas and inspiration! Such fun stuff! Thank you for the opportunity! Congrats on your new home. It looks beautiful. How blessed you are to have such an amazing family that comes together when you need them. Oh my goodness!! I see the beach and sparkles and blue!! I’m in love!! Would be perfect for my current guest room redo project. Moving into a new house, lots of space for lots of stuff.. I love that your giveaway box includes some beach colors and decor. It looks like a fun box to go through and start crafting. Love that paint color and the roses! Super cute items in your grab bag!!! My craft room needs some new Inspiration! Your box of goodies looks awesome! Thanks for being so generous! What a nice collection of craft things. Thanks for a chance to win. I really love the paint color and the stencil in your box. Thank you so much for the chance to win! Just discovered your site and am inspired by you creativity and skills. I’m a newbie furniture rehaber and I enjoy seeing what others have been able to create as well as tecnique tutorials. What a wonderful box of goodies! Thanks for the chance! Love all the goodies in your box! Thanks for the giveaway! Pretty nifty junk! I see many upcycles in that box of goodies! The box of goodies looks like a whole lotta fun! I love your blog. 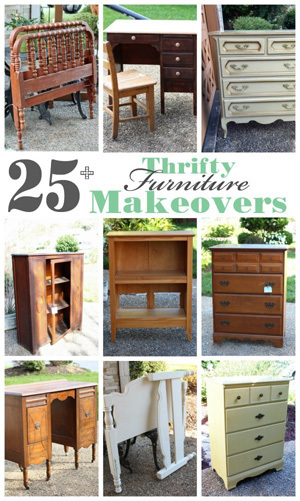 Love your furniture makeovers because it is exactly my style. I live in Florida so beachy is my style decor. Really hope I can win. I love your projects, I have learned so much! This is a great box of fun items! Thank you for the giveaway!! My pleasure, Karen! Good luck! I am so excited about the Giveaway! Thanks Christy! That looks like a totally fun box of things I use every day! Craft box looks good and all the colors I love. New house, happy for you. Can’t wait to see what you do to make it home. How exciting. So many things in this box, I hape I win. I am currently trying to find a stencil to fit a narrow space on the front of a chest of drawers, and I think the small one would fit. I have been subscribed for some time and I love your how-toos. They have really given me the courage to make some changes on my furniture. Gah! I love those roses!!! I could use some new craft stuff! Oh how fun! Love your blog. I never miss a post. What a fun box of goodies! 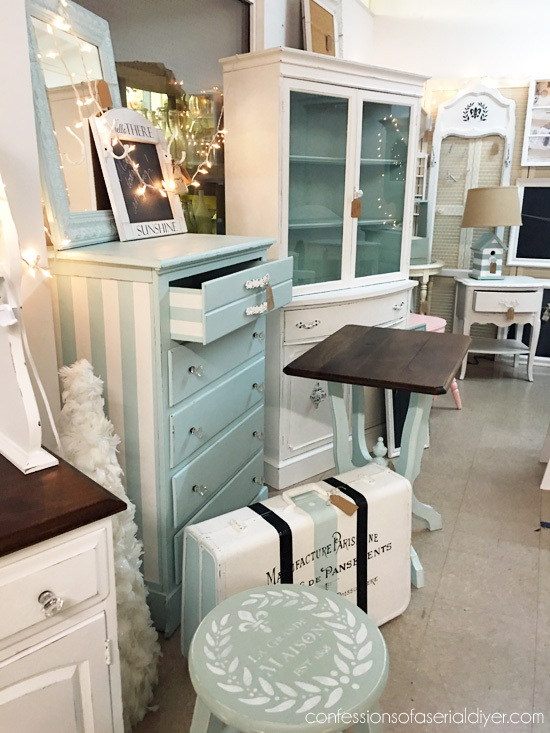 Love the paint color and that pretty fabric! Love the box of treasures! Tossing my hat in the ring. There is a way you create your posts that keeps me subscribed – fresh, clean, warm. 😊 Also, I believe that your genuine and humble heart makes your site relatable and unpretentious. This looks like it would be FUN!! Thanks for always inspiring me to try new paints and ideas! You are such an inspiration to me and so many others. Thanks for doing what you do. I look forward to each and everyone of your blog posts. I love following your posts. Your rehab of furniture is exquisite! Thank you for the inspiration. I absolutely am in love with your arts and crafts! You are just brilliant! Please enter me into your give away: I adore all things blue! Keep up the incredible work! The giveaway boxes inspire and could make so many different things! Such beautiful stuff! What a great opportunity!!! Love this–inspires me to give away some craft junk too! Paying it forward…! I so love your blog! Everything you do looks so great and looks so easy! Keep it up! I love your blog and I would love to win the August Craft Junk Giveaway. Thank you. I I love this giveaway. The fabric, rose knobs, paint and stencils are some of my favorites Thank you for this great giveaway. I love putting these giveaways together, Marlene! Best of luck to you! Thanks for the chance to win, love this! So happy I found you. I’m opening a booth at the local antique mall I’ve frequented since I was a teenager, and your blog has taught me so much about how to have an attractive space. Thank you! Best of luck to you, Chye! You have some really awesome stuff in your giveaway. Would love to win! Wonderful giveaway!! Thanks for a chance to win!! You always have the best ‘junk’, lol. Love your blog! 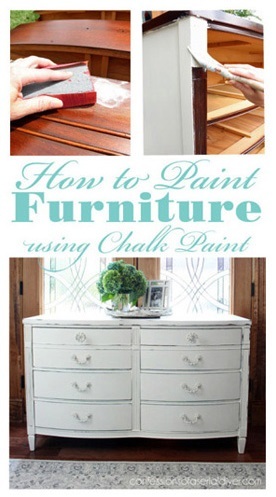 You’ve given me great ideas and suggestions on how to paint furniture. Usually I strip and stain or strip and varnish my pieces. Now I am starting to paint furniture that isn’t made from wonderful wood. Thanks so much and love your new house! Very fun box! Nancy’s is really cool, too! I follow you on email and LOVE everything you do. love your blog and facebook page. thanks for having a craft “junk” giveaway!!! I’ve been following your blog for quite some time and I love all your ideas! It’s wonderful to see these pieces restored rather than “ditched”. If I ever get to Va Beach again, I’ll be sure to check out your booth at the antique mall. Love the assortment of stuff you’re giving away. Yeaa, another Craft giveaway! Love your style, love your stuff!! Thanks for the super lovely giveaway! Hi Christy! I love your new home! I have to say I did think your other home was amazing as well though, especially the yard. I’m sure you will amaze everyone by what you do with this new one though!!! I would love to win this awesome box of goodies! I am so excited about this giveaway! Like you, I recently moved, but my move was from my parent’s home and I am now on my own for the very first time! I had no furniture, so I stalked Craigslist and garage sales and was able to furnish my entire apartment for $230. The downside was committing to painting 21 pieces of furniture in a month all while working my way through a brutal master’s program, but I did it! you and your blog were a major source of inspiration to me. I am now adding the finishing touches to my place, and this box would be a big help! I definitely want to continue crafting – painting and adding personal touches to my pieces (like stencils!) has really made my new home feel like it’s truly MINE! Christy, the box looks so fun. Thanks! Thanks for the opportunity to win the craft supplies–looks like a really good stash there! Thanks for sharing fabulous giveaway! I love all of your projects and can’t wait to see the next new one when it pops up in an email. I’ve done a few pieces here and there, but you’ve given me inspiration to drag out the big things that I’ve been putting off for years! Thanks Christy! I love that my favorite bunch of people get together to do a giveaway. You all have access to so many different products, and I would love to win. Thank you for the opportunity! Thanks for the chance to win. Love that quilted bird! Wonderful ideas and inspirations! I always enjoy your beautiful blog! Your blog is my very, very favorite! If I could only read one it would be yours – just wanted you to know how much your hard work is appreciated. I recently found your blog and have had fun going back through your posts. Thanks for all the info and tutorials you put on your blog. I have lost count of how many I have pinned!! I really hope you pick me this time I would love this box of goodies lol. The items you picked are awesome! Ooooo, I love these! What a box of treasures too!! Maybe this one’s mine, haha! Thanks for doing this again! Fun – I love random craftiness! Thanks! Congratulations on your new home can’t wait to see what ideas you have up your sleeve. I enjoy how you take old and ugly items and turn them into something new and useful. What an imagination you have. This looks like a creative explosion 💕💥 I love seeing your new posts and projects. You inspire me with all your lovely “re-do’s”. Love your projects! Keep ’em coming! 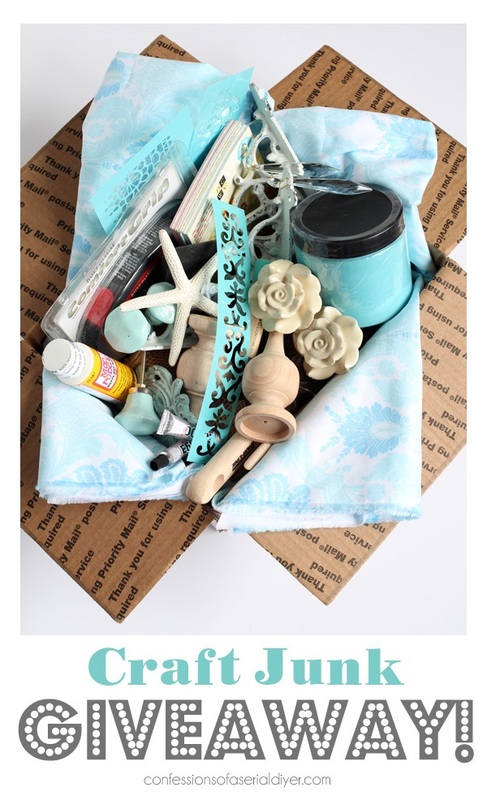 Great Gift Box to be given away…I want the paint (Oh La La, love that color) and my absolute favorite part of the box: the knobs…Oh How I Love Knobs!!!! What a joy, great things to look forward to. You are so sweet! 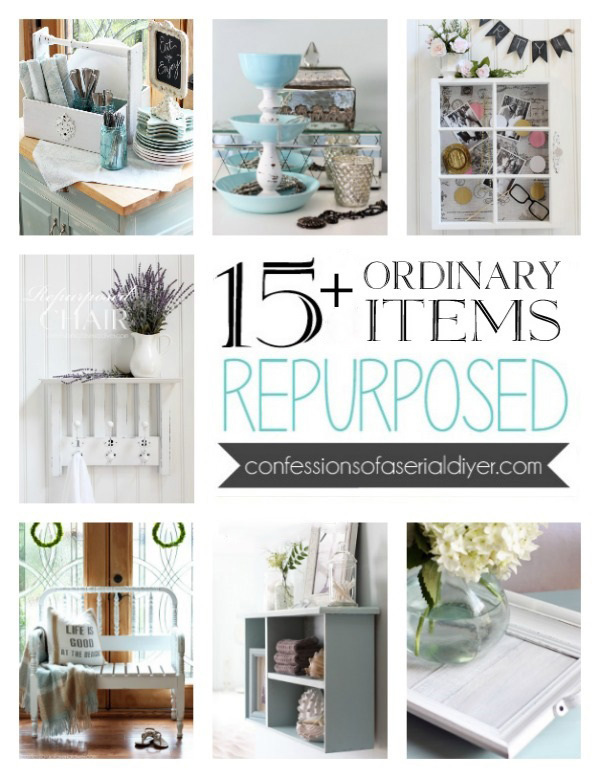 Love the blog and all your up cycling ideas! Just found your blog and I love your projects and ideas. I subscribed to your emails! lovely and fun looking giftbox . Would love to win it. I love your blog. You make me want to go out and buy power tools. So far, I just have a sander! LOL. Thanks for the chance to win some fun stuff. How generous of you! I am new to your blog and look forward to the inspiration! Looks like a box full of fun! Love the blues! I see all kinds of goodies I can use. Thanks so much ! At the top of the post was a pop-up ad for Pringles…. so I thought that was going to be in the box ! Tee hee! Wonderful goodies in the box of goodies. I am already thinking of projects for some of the items in box. Thanks for the opportunity to enter. Love the inspirational colors and textures of this box! A wonderful box of fun!!! Thank you so much for the awesome giveaway! I would also like to say your creativity is amazing. The way you can look at something and see something totally different and beautiful floors me. I hope to be able to get there some day. Thanks for all the great posts!! I would love to win this box of goodies! Your box looks the best! OOOOOHHHH, I love crafty type stuff! It gives your brain some much needed exercise. Please pick me rafflecopter! WOW…what a fun give away…how fun…thanks so much for your awesome blog..
Love your blog and crossing my fingers I get to play with this giveaway! Looks like fun in a box! I always look forward to your emails and your Blog!!! Your work is so creative and inspiring! I hope to win this wonderful box of goodies, could use it all!!! Thanks for all you do!!!! Love this whole box of goodies!! Thanks for the giveaway! What a fantastic giveaway! So many fun things! I love checking out your blog! Thanks for all the great ideas! Keep up the good work! I love watching your projects come to life. Thank you for sharing your talent while providing us with lots of new ideas! Sorry if your name came across spelled incorrectly…dang spellcheck lol! Thank you for a chance to win these items to play with. New home is looking great. Thank you for sharing the progress with us! Loving your workspace! Fingers crossed I win your great giveaway! I want those knobs! I look forward to each one of your blog posts. I can’t wait to see what all you do in your new home. I will miss the beautiful french doors you used for a backdrop. Knowing you, there will be another inspiring spot at your new home! How fun! Love that you would share with us! I’ve followed you for awhile now and love getting the notices in my email of the awesome makeovers you do. It has inspired me to do a couple of things for my home too! Thanks! Your junk boxes always look like a ton o’ fun. Thanks for the house tours and keep ’em coming. We love what you do. Love your site and thanks for a fun giveaway! Cristy, I just love, love your blog! I have a number of items to work on as well, but right now I am taking care of my 92 y/o mom. Well, at some time I’ll be able to carve out some time. You do such a magnificent job! Wonderful craft goodies look like so much fun to tinker with! Thanks for your generosity and for inspiring us each and every day. I’ve been following your blog for a long time and love everything you do! Sooo much inspiration! Thanks for sharing your talent! Oh, I just love your blog. It’s so fun seeing your new house come together from the ground up! Even (especially?!) the garage! The “junk box” looks soooo interesting. I would love to get my hands on it!! Thank you for the giveaway! I’m newish here, this is very exciting to see how you do stuff, so pretty! I like those knob pulls. Wow! Love the giveaway goodies! Love the beach theme and that blue is awesome! I am loving those knobs! That looks like a box full of yummy goodness right there! Fingers crossed!!! I am so glad to find a new blog from Knick of Time. 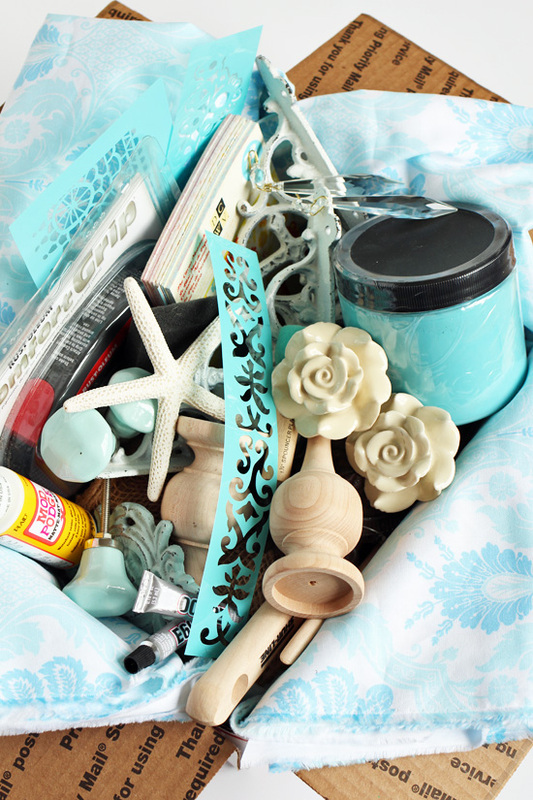 I spy some cute turquoise knobs in there. I love your Box – those knobs! That paint color! Your candid photos have greatly encouraged me. We are currently doing some remodeling and everything seems out of order. Little by little it will get done and will be worth it. I feel motivated to head out to the shed and get my tools organized now. Thanks! Also thank you for the opportunity to win some fun crafting items. That is a LOT of comments, girlfriend! Woo hoo! Just stopping in to tell you congrats on the shout-out on today’s Decorating Tips and Tricks podcast!!! I believe you are in the show notes, too! So cool! Nice giveaway ! ! ! Love the giveaway! My style is coastal since I live in Florida so all of your goodies are right up my alley! Thanks for the giveaway! I love the makeovers you do. The bench today that you shared was beautiful! We are also in the process of looking for houses to move in the next year or two! Moving to Panama city, Fl to be closer to our kids so I’m right there with you on the moving stuff. Although I havent moved in 19 years so this should be interesting! Love all you do and thanks for sharing. I am in love with turquoise, I am living at thee beach now and am redoing my decor to include beachy colors. i really enjoy your blog and this spindle bench is just lovely! 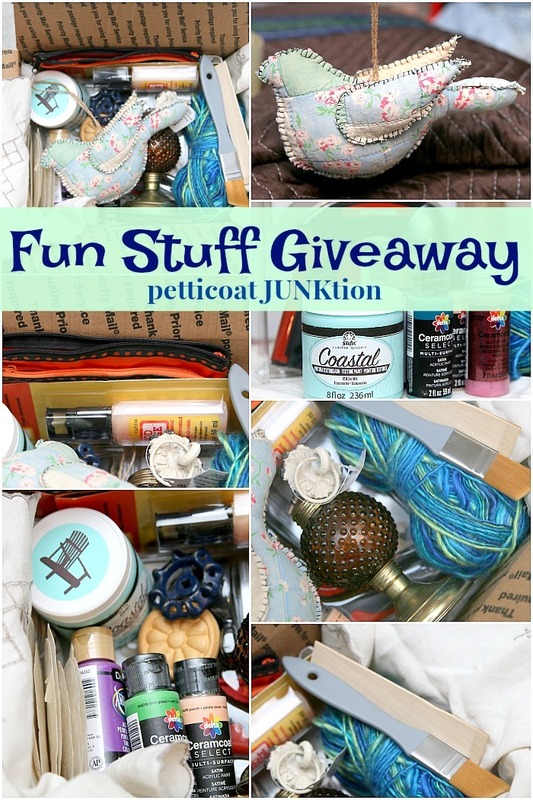 I hope I can win the craft junk giveaway; always need more junk in my own stash! New to your blog and lovin’ it! So thoughtful of you to do this giveaway! Thanks so much! Thanks for another chance to win some fun things! Love your blog and your style! That box of goodies is just my style! A girl after my own heart! Good luck, Elaine! I admire all the wonderful pieces that you transform!!! You have a great eye and talent……just wish I had your energy!! Love seeing your blog appear on my PC!! Thanks for the giveaway!!!! I didn’t realize I could have been entering every day!!! This giveaway is the most awesome! 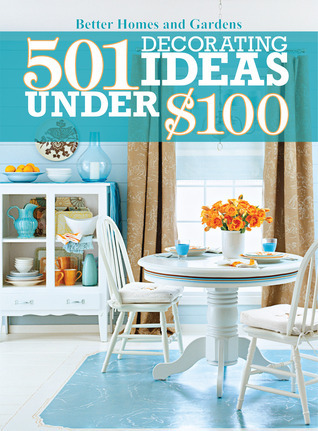 My new guest room redo is waiting…..
Yeah another give-a-way! Love that paint color.